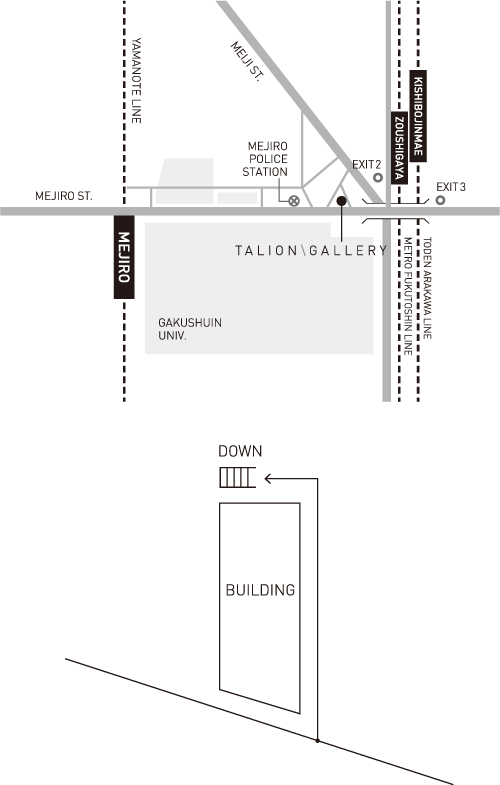 Talion gallery was founded in Yanaka, Tokyo, in 2011 and currently relocated to Mejiro, Tokyo, since 2014. The gallery is named after the jurisprudence term, "the law of talion", which mainly refers to the principle of retributive justice as known as "an eye for an eye" from the Code of Hammurabi. We titled the gallery as such for our desire to formulate a principle that generate connection between various components consisting contemporary art scene such as people, authorities, actions, languages and money, in order to overcome today's depressive situation. As the center of a vortex of creation, the gallery equally involves not only artists devoting their brilliance and collectors lavishing their prosperity but also critics throwing provocative questions and even casual spectators watching dispassionately. We believe that it is our mission as a gallery in the art world, and a mission of art itself in society, to constantly invent a provisional center of cultural production. Talion Gallery is a starting point of new culture in Tokyo and a core of creativity where despair turns into earnest and generous hope. 6 minutes walk from Mejiro station, JR line. 2 minutes walk from Zoshigaya station, Tokyo Metro line. please email us at info@taliongallery.com.